Preliminary analysis of the Enzy-003 study on naturally occuring common cold, shows a significant reduction of disease duration and symptoms with ColdZyme usage, and less use of concomitant symptom-relieving self-medications, compared to a control group without ColdZyme intervention. In this single-blinded, prospective, and controlledmulticenter study, which was conducted at six German sites during the cold season 2018, 400 participants were enrolled and randomized to either start with ColdZyme throat spray at first symptoms of common cold, or no treatment. In total 269 participants with confirmed common cold were included and evaluated in the study. 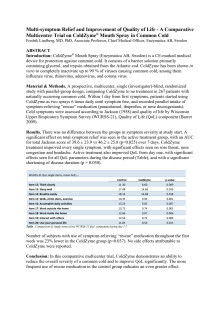 The Enzy-003 was an exploratory study designed to investigate the ability of the Wisconsin Upper Respiratory Symptom Survey-21 (WURSS-21 Quality of life scale), the Jackson score for common cold, and two different sore throat scales, to detect a beneficial effect of ColdZyme compared to a group not treated with ColdZyme. In addition, safety data and the use of concomitant symptom-relieving self-medication were recorded. All four symptom scales demonstrated an ability to detect a statistically significant benefit from the usage of ColdZyme compared to no intervention, most sensitive being the WURSS-21 functional parameters. Moreover, the use of concomitant symptom-relieving medications against common cold was significantly lower with ColdZyme users. The study also showed no difference in side effects between the two patient groups. The consistently positive results with ColdZyme in the actual study strongly indicate that ColdZyme both relieves and shortens the common cold, and reduces the need of symptom relieving medications. Further, the results support large observational studies previously conducted with ColdZyme demonstrating its positive effects. 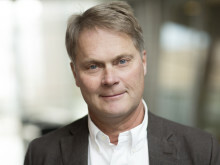 The results will provide a strong foundation to continue strengthening the brand and the claim portfolio within our clinical trial program,” says Fredrik Lindberg, CEO at Enzymatica. ColdZyme, being one of few treatments that addresses the source of common cold by protecting the mouth and throat from virus attachment, has in a few years established itself as one of the best-selling common cold products in Swedish pharmacies. Today the product is sold in Sweden, Denmark, Norway, Finland, Iceland, UK, Spain, and Greece, and through the collaboration partner STADA in Germany, Belgium and Austria. The company is in negotiations with a number of potential distributors for the launch of ColdZyme in other markets. The information in this press release is information that Enzymatica is obliged to make public pursuant to the EU Market Abuse Regulation. The information was submitted for publication, through the agency of the contact person set out above, at 8.30 a.m. on 1 October, 2018. Enzymatica AB is a Swedish life science company that develops and sells medical devices for infection-related diseases. The products are based on a barrier technology that includes marine enzymes. The company’s first product is ColdZyme® Mouth Spray, which can prevent colds and reduce the duration of disease. The product has been launched in about ten markets. The strategy is to continue to grow by strengthening the Company’s position in existing markets and expanding into new geographic markets through established partners. The company has its headquarter in Lund and is listed on Nasdaq First North, Sweden. For more information, visit:www.enzymatica.com. Enzymatica’s certified advisor is Erik Penser Bank. Prior to publication, it must be approved by Enzymatica AB (publ).